It’s always fun to speculate how a yacht got her name. 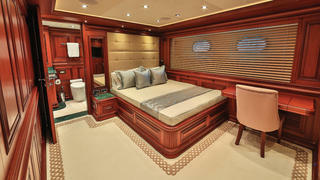 Clarity’s owner saw the Bilgin 160 under construction and envisioned what he could do to perfect her. Was that how she got her name? So much for that idea, Clarity was already the name of his Johnson 87. The new Clarity, a graceful 48 metre yacht (including the 5.5 metre bowsprit) that her owner and Bilgin Yachts exhibited at the 2015 Fort Lauderdale International Boat Show, is not easy to fit into one category: new build, refit or even classic. She is a little of each. The “classic” part is obvious. She looks like she was born in a different era, but she is a recent creation from Bilgin Yachts, a custom yacht builder based in Istanbul, Turkey, and she is the second boat in the Bilgin Classic 160 series. The first, M&M, was launched in 2012 and was recently renamed Timeless. No particular vessel inspired the design. “We have built our classic series with our own ideas,” says Yildirim Bilgen, the company’s sales director. 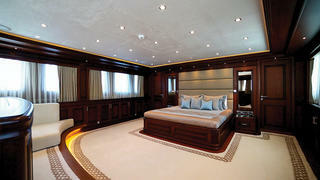 “The main idea was to build a yacht with a design that will last forever.” Bilgin did the styling in-house. Turkish boat builders, in particular, are very well-versed in wood construction, and Bilgin’s experienced craftsmen, with top-notch tooling at their fingertips, had no trouble recreating the feel of a bygone era. The shipyard also builds cold-moulded vessels, such as 44.2 metre Elada, with a reverse bow developed with H2 Yacht Design and delivered last year. 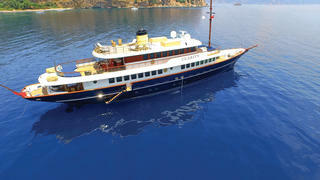 For the classic series, however, Bilgin selected steel for the hull and composite for the superstructure. The full-displacement hull has a bilge keel and bulbous bow for all-ocean seakeeping. Modestly powered Caterpillar engines yield a serene cruising speed of around 10 knots befitting of the yacht’s appearance. The attractive funnel that she sports is a mere concession to styling, as are the mast and bowsprit. Inside, Clarity has no shortage of modern conveniences, including a galley with stainless steel appliances, navigation and electronic equipment, zero-speed stabilizers and VSAT. “I think the Classic is just that — a classic. 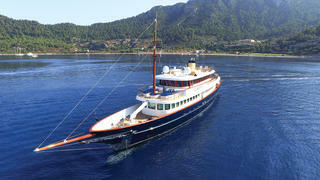 It reminds me of the glory days of yachting, or the romance of yachting with the style to match,” says Clarity’s owner. “I think it takes one back to the days when Onassis would entertain the film stars, world leaders and celebrities on the Christina O or earlier to the days of Errol Flynn and Olivia de Havilland sailing around the Caribbean. We have been careful obviously to have every modern convenience, technology and toy on the vessel, but we also worked hard to give her a chic, comfortable interior. So, is Clarity a new build or refit? Actually, she’s a bit of both. Bilgin Yachts received great response from its first Classic 160, even as she was under construction, and started building the second Classic before it had a firm order. Hull No. 2 was already very advanced but on hold when she attracted the attention of her current owner, who thought she could benefit from a few tweaks. That’s where the refit part comes in. “The new layout was based on utilizing the space much more effectively than the previous design. We wanted the interior layout to be much more of what you would expect on this type of vessel with every modern amenity not only for guests but also for crew,” he says. His vision required reconfiguring all decks, especially the main and lower decks. Step one was moving the crew quarters from their location forward on the lower deck toward the aft section, and creating two new interior accesses, one from the galley and the other from the guest corridor (originally the only access to the crew quarters was through a foredeck hatch). Three crew cabins, a mess and a laundry room are now in close proximity. The captain has a nice double cabin next to the bridge. Step two was transforming the space previously occupied by crew cabins into a beautiful en suite for the master suite, which is located forward on the main deck. 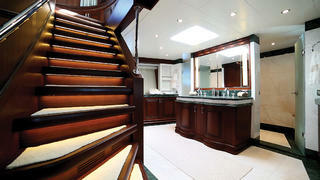 The bed still faces a gorgeous span of windows and stairs now lead down to a marble bathroom. Step three was adding a convivial bar on the upper deck and expanding lounging areas. Clarity looks just as attractive as Timeless and lest you pay attention, the two Classic 160s may appear identical — then you notice the mast has moved from the main deck to the upper deck. Little by little, like a game of ‘Spot the difference’, more of the details that set them apart emerge from the big picture. 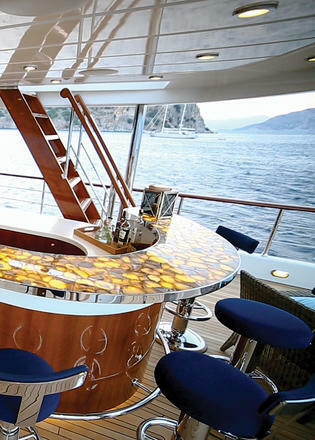 The superstructure on Clarity is longer to accommodate the master stateroom/en suite redesign and her upper aft deck sports a large, horseshoe-shaped bar. The sunpads forward on the bridge deck are much larger. The coaming is higher, LED lights underline the deck, the bridge deck now has a dayhead, there is new storage and passageways and the life rafts were repositioned, among the many differences. Looking at the results, you’d think accomplishing this transformation was easy. There is nothing that feels forced or contrived about the layout — it works. Project manager Frank “Bobby” Ball oversaw and meticulously documented the conversion. Creating Clarity as she appears today meant the yard had to cut through steel, remove bulkheads, reroute pipes and get approval for each step from classification society RINA. The early days felt more like destruction. 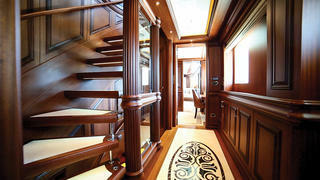 With several facilities in sprawling Istanbul, Bilgin Yachts does most everything in house and employs several engineers. It is currently expanding its building capacity with a large new construction hall on the grounds of West Istanbul Marina. This year, it delivered both 49.9 metre Dursur to an owner from the Middle East and Clarity, the first Bilgin to come to North America.